to ensure optimal canary condition. There are MANY diseases and canary illnesses that can halt your canary's singing and even kill your pet bird. You want your bird to have a STRONG immune system to fight off any viruses or bacteria that your canary may come in contact with. First, let’s talk about what canary care strategies you can use to prevent illness and promote good health for your canary bird. After all, "An ounce of prevention is worth a pound of cure". Cage cleanliness is the foundation of good canary health. It's not uncommon for a canary illness to arise due to filthy living conditions. bottom of the cage disinfected at least weekly to help keep your bird happy and healthy. Use newspaper cut to size at the bottom of the cage. Or cardboard. They're both cheap or free. An antimicrobial cage liner product is great if you don't mind spending a few bucks. However, don't use anything that has a waxy finish. It will not absorb moisture. The droppings will just sit there and collect bacteria instead of quickly drying out. You can buy gravel cage paper already cut to size and made especially for bird cages but I don't recommend this paper for canaries. Your canary will consume the grit from the bottom of the cage where his droppings are. pine shavings, corn cob, walnut shells, kitty litter, hay, or cedar shavings. Once a month, or more, you'll want to disinfect the walls of the cage to protect your canary's health. Water and food dishes should be rinsed out daily and disinfected weekly or more to help protect against bacteria growth. Disinfect with a solution of 10% bleach to 90% water. Put in a spray bottle and spray the whole cage plus dishes (not his food of course). You can also soak a rag with this solution and wipe or scrub as needed. Rinse dishes and dry thoroughly before replacing. There are also some custom products specially formulated to quickly dissolve hard dried droppings. Canaries are very clean birds. If possible most would bathe themselves everyday. NOTE: Not every canary will take advantage of his bath. Keep providing the bath and water though. He may eventually discover how great it is to splash around. If not, don't worry. Some birds just refuse to bathe. (Like some humans I know.) You can always use a spray bottle to spritz him with water once a week or so. Provide your canary bird with a bath regularly. Let him bathe at least twice per week for good canary health-->Three or four times is much better...Everyday is better yet. A simple shallow bowl will suffice but specially designed canary bird baths are a big help for keeping the mess to a minimum. Click here for special information on summer canary care. ...Not just canaries...MOST animals must get these three items from their diet for good health. You can provide a nutritious diet with a good canary seed mixture, fresh fruits and veggies, and healthy treats. Click here to learn more about how a balanced diet can keep your canary healthy. If you've already overdone it with the unhealthy canary treats (cake and cookies) you may have ended up with a fat canary on your hands. If so...Click here to learn more about handling your big fat canary. Everybody knows that exercise is good for you, right? If you have a decent size cage for your canary he will be able to flutter back and forth between perches. But how about letting him out of his cage once in a while. It's "fluttering" times 10 and great exercise. Click here to learn more about canary exercise. ...can be the reason you end up with a sick canary bird on your hands. Your bird does not have the ability to filter out toxins in the air as mammals do. Fumes from an overheated non-stick pan can kill your canary quite quickly. Be very careful with household cleaners like ammonia, bleach, floor and furniture cleaners, bathroom cleansers, etc. Pretty much anything that has a chemical odor to it can be toxic to your canary. No matter how mild you may think it is, it can be harmful to canary health. Unfortunately, no matter how clean you keep your canary's environment he will have toxins in his system over time. Toxins are in the air everywhere and in the water. A canary can do extremely well all alone. That is, as a single bird in the house. However, your bird will be happier and more content if he knows (or at least thinks) there are other canaries nearby. You don't have to get another canary though for good canary care. 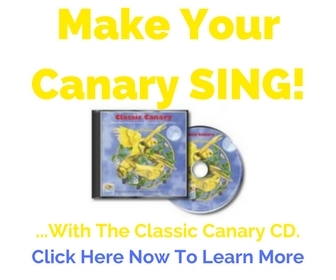 Click here to see how to make your canary bird feel emotionally healthy and increase his singing. Even your canary needs "routine maintenance". You change the oil in your car ever 3 months right? Well, you should check your canary about every 3 months too. He should be inspected for illnesses and injuries. His feathers and skin can tell you many things about his health status. In order to do this of course, you'll have to catch him. And don't worry...it most likely won't hurt him. He won't like it, but it won't hurt him. In fact, it'll help him. Learn more about catching, holding, and doing "routine maintenance" on your canary...click here. Canary claws or nails can end up having a negative effect on canary health if allowed to grow out of control. Fortunately, canary nails don't grow near as quickly as humans. They will need to be clipped about twice per year. Some people recommend wrapping the perch with sandpaper to keep the canary's nails wore down. THIS IS A NO-NO! The sand paper will damage your canary's feet. 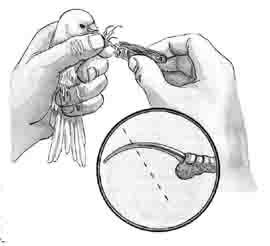 When you clip your canary's nails look carefully for the vein inside the nail. It can sometimes be difficult to stop the bleeding if you cut into it. To learn the symptoms of a sick canary and what to watch for go to my Sick Canary Page...click here. Click here to return from Canary Health to CanaryAdvisor.com Home.